There are very few other dress codes that require two totally different vibes in the same way that smart casual demands—no wonder it's the trickiest of them all. 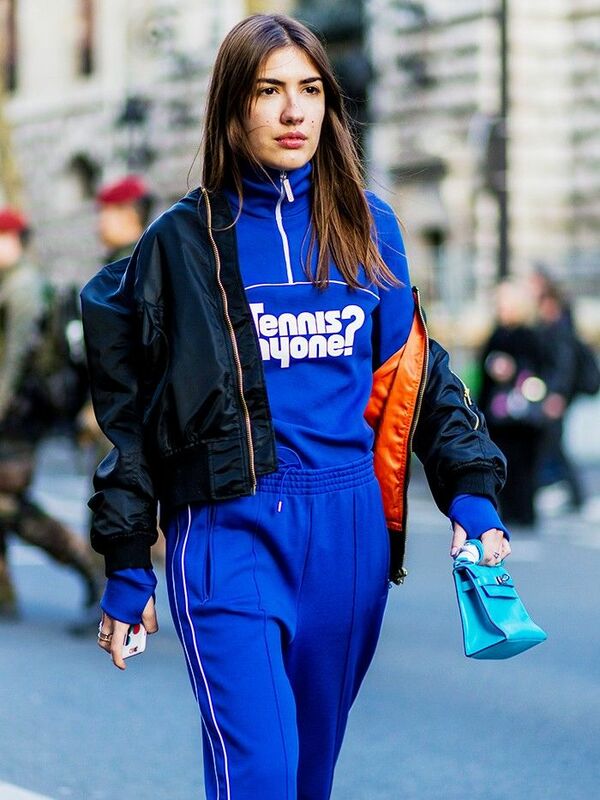 No one ever says I want to turn up in evening sportswear, right? So don't beat yourself up if acing that 50/50 mix of pulled togetherness with laid-back pulled-off-the-floor–ness isn't always making itself clear in your wardrobe. This is a skill many a style blogger has now mastered, party because they are naturally adept at styling, but partly because in the creation and documentation of so many outfits you can start to see patterns that emerge (that's why we fully encourage you to take snaps of your own looks that work for future reference). Scroll down for the kind of ensembles you can cut and paste into your own closet this weekend and beyond! Smart-Casual Tip #1: Throw a long white coat over your regular denim look. 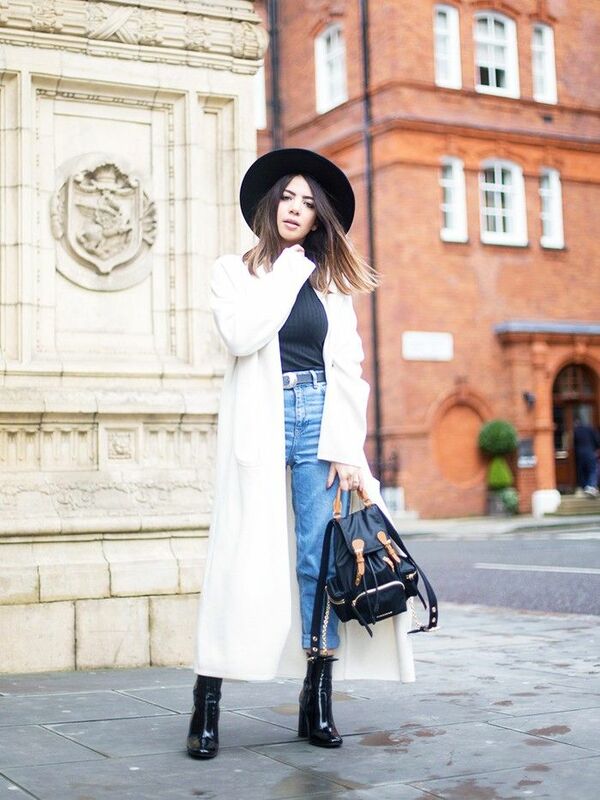 On Reem Kanj of Five Five Fabulous: ASOS Matador Felt Hat (£22); Charlie May coat; Topshop Petite Pretty Mom Jeans (£40); Burberry The Medium Rucksack in Technical Nylon and Leather (£795); Office Incense High Cut Boots (£90). Smart-Casual Tip #2: Punctuate minimalism with a standout pair of low heels. On Pernille Teisbaek of The You Way: Céline coat and shoes; Acne Studios jeans; Loewe clutch. Smart-Casual Tip #3: Add posh espadrilles to easy separates. On Peony Lim: Ray-Ban Round Metal Sunglasses (£125); Isabel Marant jacket; Gap Utility Chino (£30); Hermès bag; Chanel shoes. Smart-Casual Tip #4: Style out a smart skirt with grunge attitude. On Natalie Suarez of Natalie Off Duty: C/Meo skirt; Marie Turner The Libertie Bag (£383). Smart-Casual Tip #5: Wear oversize shapes with slick accessories. On Zina Charkoplia of Fashion Vibe: Zara coat and culottes; ASOS Trapeze White Shirt with Lace Insert (£25); Chloé Medium Faye Bag in Embossed (£1280); Gucci New Power Horsebit Loafers (£450). Smart-Casual #6: Shoulder-robing over a casual outfit instantly transforms a look. On Lucy Williams of Fashion Me Now: Maje coat; Isabel Marant Étoile Seersucker Button Down Shirt (£170); Vintage Levi's; Céline sunglasses; Mulberry Kite Clutch (£495); Gucci Leather Belt with Double G Buckle (£200); Tony Bianco Sugar Boots (£126). Smart Casual Tip #7: Pair black ankle boots with a pretty dress. On Alice Zielasko of Alice Point: Privacy Please dress; Louis Vuitton Twist Malletage Bag (£2000); Topshop Master Tortoiseshell Heel Boots (£85). Smart-Casual Tip #8: Two strap sandals will always add a sleek edge to denim. On Aria Di Bari: Theory Gabe Stretch Blazer (£160); Zara shirt; Topshop Moto Dark Blue Mom Jeans (£40); ASOS sandals. Smart-Casual Tip #9: High-shine shoes add polish to any ensemble. On Gala Gonzalez of Amlul: Marks and Spencer Limited Edition Pinstripe Jumpsuit (£50). Smart-Casual Tip #10: Wear a printed tee with grown-up tailored trousers. On Courtney Trop of Always Judging: Always Judging x Velvet by Graham and Spencer Rhiannon Graphic 1987 Tee (£95); Chanel trousers; Balenciaga Le Dix Cartable S Leather Bag (£1195); Jenni Kayne shoes.